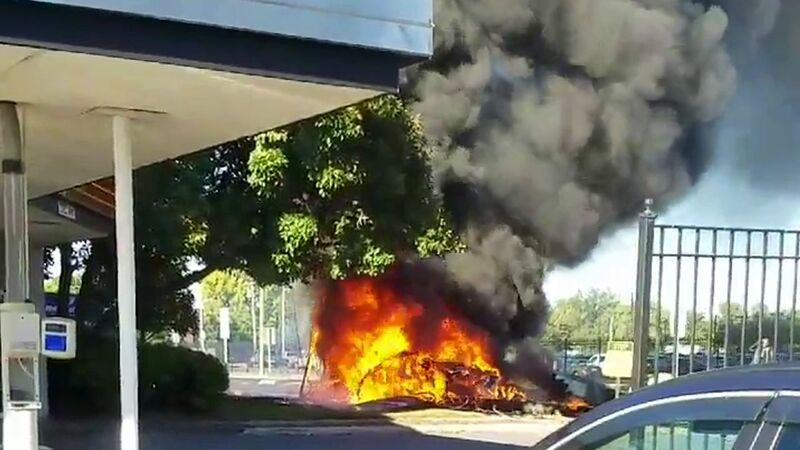 EAST HARTFORD, CT -- Authorities said one person was killed and another injured when their small plane crashed and burst into flames just before landing at an airport in Connecticut Tuesday afternoon. The FAA said the Piper PA 34 aircraft went down on East Main Street in East Hartford near the Connecticut River at about 3:40 p.m.
"The aircraft was on final approach to Runway 20 at Hartford-Brainard Airport," the FAA said in a statement. Telephone poles and wires were knocked down in the crash, leaving about 500 without power. Some roads in the area have been closed while police investigate. The Hartford Courant reports that the plane took off from Hartford's Brainard Airport on Tuesday with a student pilot and an instructor on board. They were attempting to land at Brainard when the plane struck a utility pole in East Hartford and crashed. Police say the plane's pilot was taken to a hospital with serious burns and that the passenger was still in the wreckage and presumed dead. Police did not identify either person. Two people who were in a minivan near the crash were also taken to a hospital but were not injured. Officials from the Federal Aviation Administration arrived to investigate.